يقع في Melbourne CBD, إيبيس بدجيت ميلبورن إيربورت إنه المكان الأنسب لاكتشاف ملبورن و ما يحيطها. يقع مركز المدينة على بعد 0.5 km فقط. ويمكن الوصول إلى المطار خلال 35 دقيقة. يشكل هذا الفندق ملاذاَ مريحاً للاسترخاء ويمنح زواره فرصة للاستجمام والتجدد، وهو يقع على بعد خطوات من المعالم السياحية الكثيرة للمدينة كمثل: Minotaur Entertainment Melbourne, Australian By Design, Haigh's Chocolates Block Arcade. استمتع بالخدمات الراقية والضيافة التي لا مثيل لها بهذا الفندق في ملبورن. يمكن الاستمتاع بمجموعة من الخدمات على أعلى المستويات في الفندق كمثل مكتب الاستقبال على مدار الساعة, مرافق مخصصة لذوي الاحتياجات الخاصة, تخزين الأمتعة, صف السيارات, جولات. تعكس غرف الفندق البالغ عددها 146 المنتشرة في طوابق جواً من الدفء والألفة.خدمات عصرية مثل تلفزيون بشاشة مسطحة, سجاد, بياضات, مرآة, مناشف موجودة في بعض الغرف المختارة. يمكنك الاستمتاع بالأجواء المريحة التي تقدمها حديقة طوال النهار. يشكل إيبيس بدجيت ميلبورن إيربورت بخدماته الراقية وموقعه الممتاز، قاعدة مثالية للاستمتاع بإقامتك في ملبورن. 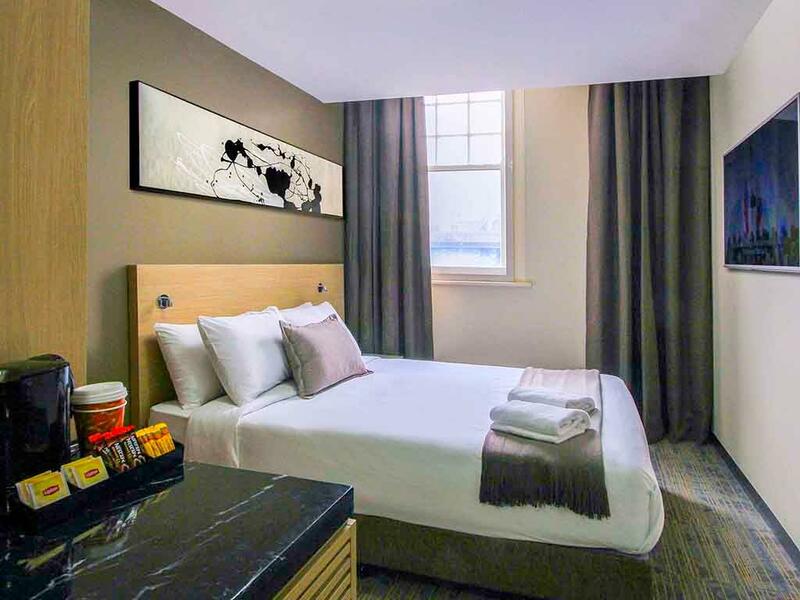 The hotel is very easy to find and it's outside a tram stop on Elizabeth St (Collins St, Stop 2) The room we had was a standard Queen room and it was very small with no view. The toilet was very cramped when sitting down and if you don't like being closed in then this could affect you. I highly recommend you get 2 keys as you'll need it if you want to operate the aircon while your out. Everything is close by and it's roughly a 7 - 10 min walk to a Coles supermarket and Flinders Street Station. Breakfast is $9.00 per person per day but I didn't have order it. I didn't pay a bond which was great. I would stay here again and rate it 9/10. We went to a concert at AAMI Park and stayed at IBIS Budget. It is a budget room, but for the amount of time we were there, it was great. Comfy bed, air con worked, hot water, quiet room and great location - all at a budget price. 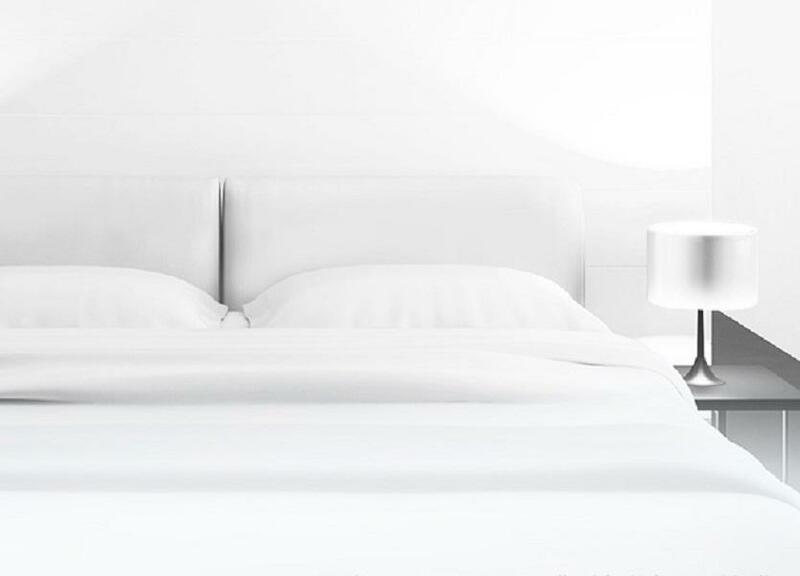 Great for overnight stay. It was clean and tidy, beds comfortable, only tea and coffee no biscuits or anything else. Nowhere to hang hangers only small hooks for three items each person. Was quiet and breakfast was good value. Very small shower unit with a curtain for privacy. Over all an ideal location and a adequate stay for a short visit! Great location in Melbourne CBD, clean and reasonable price. It is small but it's sufficient. The downsides are shampoo is not provided, the security could be better and the floor I was in seems like it's under renovation. It’s located in the CBD area with accessible tram stops, and walkable to attractions nearby. Staff were very friendly. Overall, it’s a reasonably priced budget hotel room that’s worth it. One of the two lifts was under upgrade, though not as convenient, but it shows the hotel’s commitment to serve the customers better. We were transitiing oin Melbourne and needed a place to stay for 1 night. 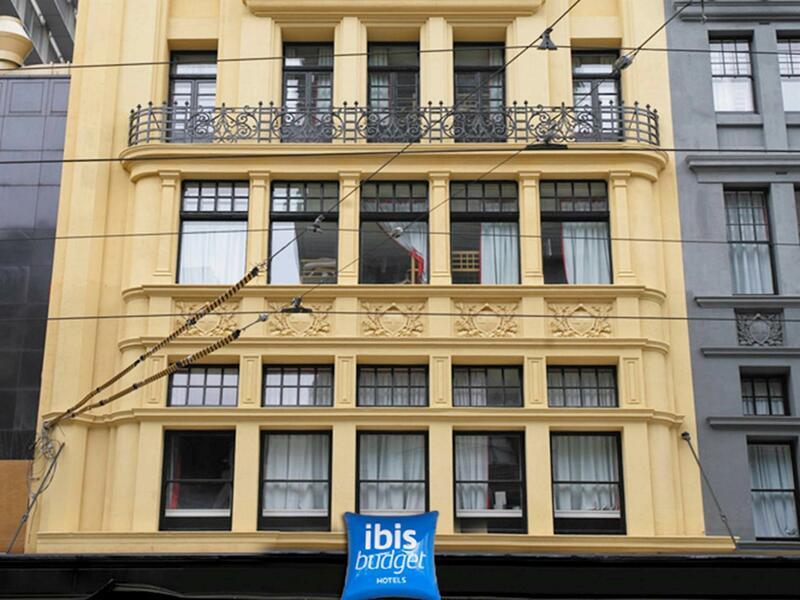 Ibis fit the budget . We like it because of its central location, tram is on the door step, close to major shopping areas, atm next door. The room is a little too small for our liking but that's ok for the price you pay and its melbourne! the toilet./bathroom has no walls... so it is so close to the sleeping area. You only have a shower curtain to separate the space. Breakfast was decent. A very convenient location, in Central and China Town. Queen size bed with a small living room with sofa and round table and 3 chairs. Toilet is very big, remember to bring the shampoo, shower gel as they only provide soap. Highly recommended. It was a pity I hadn't been warned of the renovations as the public areas were non-existent, including the dining area. I was, however, told that the two old slow lifts would be replaced by the time I stayed. Unfortunately only one new one was in operation and the other was out of commission. Because of renovations the public area floors and carpets were not clean. However, my room was kept very clean. The hotel is in a very convenient, central spot so I hope to return next year when renovations are complete to gain a better impression . Very nice hotel.... service ok but the location is amazing. I loved everything about this hotel. It has everything you need for a quiet and comfortable business stay at a budget price. The staff were fantastic, all of them stopped to greet me and seemed very happy at their place of employment. Look forward to staying here again. Superbly located at junction of Elizabeth and Collins streets. Central in CBD with free trams in front and shuttle bus drop off using Skybus from airport. We walked 15 min to Sourthern Cross station on return trip. Restaurants, convenient stores and Coles supermarket nearby. Room is small, very basic. Tips: Bring own shampoo and toiletries, however soap bar, towels and toilet rolls provided. The hotel does not feel cheap at all. The bed is comfy. The TV is big. The location is supergreat. The staff is really great. Only the toilet/bath is quite small. Checkin and check out is fast and easy. Super satisfied! Great location, within free tram area, with food variety available within footsteps. The facilities are minimal and fit for purpose. It is for the traveller who wants convenience and content with basic necessities at the accommodation. The area feels safe for walking around at night. Overall are OK and I will back here again if I back to Melbourne. The location was great. just a short walking distance to shop, mall, and tram station. 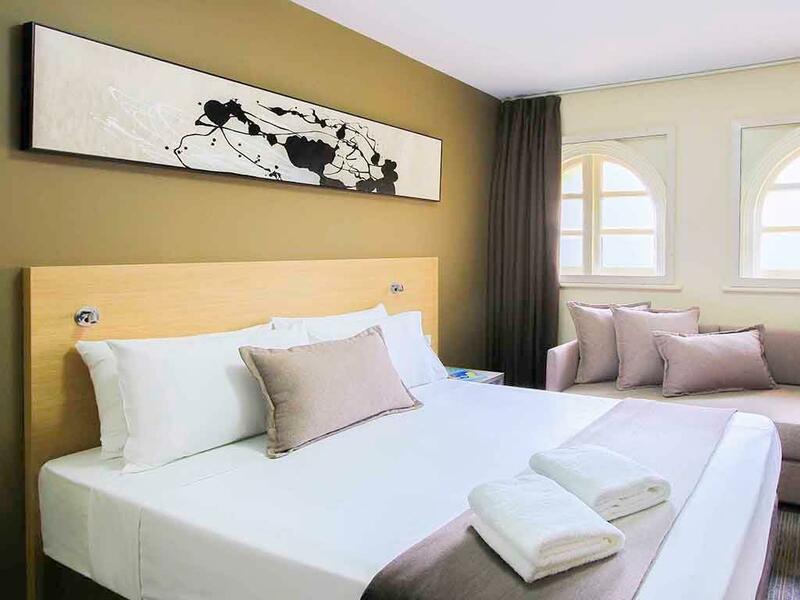 The airport Skybus also offer free hotel shuttle to this hotel, so no need to worry to find the hotel if you came from airport and take the Skybus. Superb location. Walking distance to flinders train Railway. Surrounded by free trams to various location. Nearby macdonald/kfc/coles supermarket. Room is spacious enough for 2. Huge tv. Overall a pleasant stay!